Good morning, everyone. As I stand here at the podium, I usually wish and hope to see your happy faces. Why? This is not a place where you feel fear or tension. But you always look nervous when I stand here. Heavenly Parents and True Parents always have a smiling look. Heavenly Parents and True Parents are sad, but, are centered on love, so are always smiling. Satan is not like that. Always there is resentment, hatred, jealousy, etc., such fallen natures. The facial look is always dreadful. Is Chung Pyung comfortable? Or not? Then, why is your facial look so difficult? As I communicate with Heavenly Parents and True Parents, I realize that you can make happiness. It depends on your lifestyle. You are making your own life. After the Peace World Center was constructed, True Father called me quietly. He said, the Palace, the Peace World Center, etc. you must have gone through difficult situations. How much money you must be indebted to others. But, your look is okay, satisfied with True Parents, and happy. So, how many debts do you have? I told him there were no debts. True Father said to me: be truthful, and I will help you. I told him there were no debts. True Father was very surprised, and expressed sincere thanks to me. Later, True Father came to the Cheongshim tower and, sitting on the bench, True Father told me: until my 100th birthday, please continue the work. The words he gave were like those given in a father-daughter relationship, or parent-child relationship. Such were the words given to me at that time. At the same time, True Father told me to set up clear witnessing activities. Until 2020, witnessing activities must be set up. These were the sincere words of True Father. What about our own mind? Until 2020, and centering on Korea, 40 nations were decided. While True Mother is on the earth, we must accomplish until 2020. Are you doing witnessing activities? I began to weed the garden near the Peace World Center. When I went there in the afternoon my heart was painful. Hoon Mo Nim was very sick at the time. I went at 6:30 and weeded 6:30 until 9:40 pm, and saying: True Father I am sorry. I did not love all things. Even though the design for the Peace World Center was well-made, I didn't take good care of the garden. Then, I went to Sun Moon University, so no weeding. Then, later, again, I did weeding. I realized this is the mind of Heavenly Parents and True Parents. One staff member came and did weeding. In the morning and afternoon, we did weeding. 10,000 people came for an event -- some car company. Some very well-dressed people came to the garden for picture-taking. If I had not weeded, they would have complained about the place. As I weeded, I noticed the character of the grass. There was no "end" of pulling out the root. 40-day people trained, and weeded, but only pulled out the first part, and did not take the whole root out. Then, when I saw the root, there was a place for new buds. The trainees aren't aware of the root system, and only took out the high part of the root of the mugwart. Our members can take out evil spirits like this also. When weeding, they should pull the roots of weeds out. Flowers were moved and given new soil, re-planted. 40-day people only took out the four leaf clovers. I had to take out the root parts. There is another grass. The roots are very deep. Some weeds, some parts are taken out easily, but you need a hoe in order to take out the whole part of the root. I told a lecturer, this looks like skin with atope. As I weeded, I said: "didn't you think evil spirits work like this?" In this way, we studied well. I have a concept that staff members do things in a certain way. Some staff members only take some parts; another staff member were working so hard, as I was working. Weeding attitudes are similar to our daily lives. Their family lives will be the same as their weeding. Yesterday, I looked to see if I could help your daily lives well. I felt sad. There are so many evil spirits. Among the 2nd generation. Many "challenged" members are coming to the hospital. When I see 2nd generation members, they are mentally ill and challenged. In the outside world, increasing numbers of people are becoming mentally ill. There is a 32% increase in the number of disabled children in the outside world. In the Unification Church, the number has almost disappeared. When I see pregnant sisters, I see many problems, but through Chung Pyung workshop, the problems are solved. Some members cannot sleep, they can't lie down, etc. This is made by evil spirits. The place to remove Satan and evil spirits is Chung Pyung. Members don't realize this. Some members have not come to Chung Pyung even once. You have to work hard. The pollution is increasingly bad. Yesterday, some dust came to me, and I had coughing. In Japan there is much pollution, and it can make cancer. There are many obstacles in the blood. Prevent environmental pollution. Pollution is spreading. To prevent that spread, in advance, is Chung Pyung. You believe in Chung Pyung, so you come here. 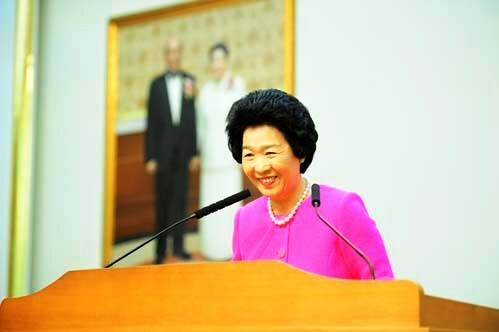 True Mother said: every workshop should be done in Chung Pyung. In chan yang session, you remove evil spirits, sins, fallen natures; and your blood, muscles, bones, can become strengthened. In your lungs are many bronchial tubes, and there is a lot of dust, as if you smoke. There are many diseases. High fever, cold, problems cause by bronchial tubes, and later lung cancer can develop. You have to take care. Take care of yourselves. As I weed at the Peace World Center, I feel I have to care for you one-by-one. There were buses parked at the Peace World Center as we were weeding. A bus driver asked one staff member about the Cheon Cheong Gung (Palace). The bus driver knew the whole area belongs to the Unification Church. So, everywhere has to be prepared enough. It is the same with our body. My (each of us) body belongs to Heavenly Parents and True Parents. So, we have to be healthy. From your mind, to your whole life, we have to be careful so that Heavenly Parents and True Parents can abide and dwell inside me. This is very important. If it is not this way, then it is not right. All of you, take care well. Staff people are always working. A member ate lunch outside, noodles, and I asked: did you eat well? The person said no, but since Dae Mo Nim works hard, I feel I have to work hard, or die. So, he works hard. Does Hoon Mo Nim feel tired? Yes. Today I am tired, and tomorrow I must go to Japan. But, I have the mind, if someone comes and looks at Chung Pyung, and Chung Pyung does not look nice, it is not good. We really need to take care of ourselves, investing our whole heart. This is what I want to say to you. If Heavenly Parents and True Parents look at me, and worry? We have to care for ourselves. If not, we can't make myself as a completed man or woman. In following Dae Mo Nim, one staff member, felt to work so hard as to die, and so had no appetite. Is that a good attitude? I have to take care, and become aware of God's property. We have to check, am I the "owner"? If I calculate the amount of work by financial terms, I have done one month's work. So, there is a lot of economic loss. You have to become the owner of yourself. When you have cancer, or come for counseling, I see that you could not keep yourself. You can make muscle, bones, blood vessels, better. If you endure you can become a person of character. But, you don't. I want to help this aspect. I went to one place, in the background there were beautiful flowers in bloom, but some mugwort (weeds). I took the weeds out. Because of the weeds, other flowers struggle. The owner didn't see it. But staff people went. You are doing what you did in Chung Pyung. We need to be the owner. True Mother proclaimed 2020, and True Father's Sunghwa commemoration will be soon. For one year, what did we do? We shed tears (after True Father's Seunghwa), but we forgot True Father! If True Mother is not in the physical world, we have to work harder. Do you understand? Can you do it well? It has been 20 years since I came to Chung Pyung. I promised many things here at the podium, right? How much of those things have I kept? There has been a lot of progress, but we need more witnessing activity. Here in Chung Pyung I will do my best to help you. I will become such a person. All of us, be happy, be healthy, more than anyone. We have to have happy families. We have to accomplish God's will. I will close here. Thank you.